Post from October 1, 2018 (↻ October 12, 2018), filed under Philosophy. Another part of my random, untargeted book highlight series, here are some snippets from Karl Marx’s and Friedrich Engels’s The Communist Manifesto (1848). Emphasis as it appears in the original work may be missing, and my own edits, though marked, may be broad. Then, important: By sharing these highlights I neither implicitly endorse nor recommend respective authors and their views. Assume that I know little of the authors, and that I have a nuanced view on the matter. (The only thing the highlights can tell is that—much like the books themselves—for some reason or other I found them of interest.) When detailed understanding of my views is important, ask me. In the earlier epochs of history, we find almost everywhere a complicated arrangement of society into various orders, a manifold gradation of social rank. Society as a whole is more and more splitting up into two great hostile camps, into two great classes, directly facing each other: Bourgeoisie and Proletariat. [Free trade:] In one word, for exploitation, veiled by religious and political illusions, naked, shameless, direct, brutal exploitation. The bourgeoisie cannot exist without constantly revolutionising the instruments of production, and thereby the relations of production, and with them the whole relations of society. The need of a constantly expanding market for its products chases the bourgeoisie over the whole surface of the globe. It must nestle everywhere, settle everywhere, establish connexions everywhere. The bourgeoisie has through its exploitation of the world-market given a cosmopolitan character to production and consumption in every country. […] In place of the old wants, satisfied by the productions of the country, we find new wants, requiring for their satisfaction the products of distant lands and climes. […] as in material, so also in intellectual production. The bourgeoisie, by the rapid improvement of all instruments of production, by the immensely facilitated means of communication, draws all, even the most barbarian, nations into civilisation. The cheap prices of its commodities are the heavy artillery with which it batters down all Chinese walls, with which it forces the barbarians’ intensely obstinate hatred of foreigners to capitulate. The bourgeoisie keeps more and more doing away with the scattered state of the population, of the means of production, and of property. It has agglomerated production, and has concentrated property in a few hands. The necessary consequence of this was political centralisation. Into [the place of feudal relations] stepped free competition, accompanied by a social and political constitution adapted to it, and by the economical and political sway of the bourgeois class. […] the epidemic of over-production. Society suddenly finds itself put back into a state of momentary barbarism; it appears as if a famine, a universal war of devastation had cut off the supply of every means of subsistence; industry and commerce seem to be destroyed; and why? Because there is too much civilisation, too much means of subsistence, too much industry, too much commerce. […] how does the bourgeoisie get over these crises? On the one hand inforced destruction of a mass of productive forces; on the other, by the conquest of new markets, and by the more thorough exploitation of the old ones. […] the proletariat is recruited from all classes of the population. […] every class struggle is a political struggle. This organisation of the proletarians into a class, and consequently into a political party, is continually being upset again by the competition between the workers themselves. […] the proletariat alone is a really revolutionary class. The other classes decay and finally disappear in the face of Modern Industry; the proletariat is its special and essential product. The proletarian movement is the self-conscious, independent movement of the immense majority, in the interests of the immense majority. The proletariat of each country must, of course, first of all settle matters with its own bourgeoisie. The modern laborer […] instead of rising with the progress of industry, sinks deeper and deeper below the conditions of existence of his own class. He becomes a pauper, and pauperism develops more rapidly than population and wealth. And here it becomes evident, that the bourgeoisie is unfit any longer to be the ruling class in society, and to impose its conditions of existence upon society as an over-riding law. It is unfit to rule because it is incompetent to assure an existence to its slave within his slavery, because it cannot help letting him sink into such a state, that it has to feed him, instead of being fed by him. The essential condition for the existence, and for the sway of the bourgeois class, is the formation and augmentation of capital; the condition for capital is wage-labour. Wage-labour rests exclusively on competition between the laborers. […] What the bourgeoisie, therefore, produces, above all, is its own grave-diggers. Its fall and the victory of the proletariat are equally inevitable. The Communists are distinguished from the other working-class parties by this only: (1) In the national struggles of the proletarians of the different countries, they point out and bring to the front the common interests of entire proletariat, independently of nationality. (2) In the various stages of development which the struggle of the working class against the bourgeoisie has to pass through, they always and everywhere represent the interests of the movement as a whole. The immediate aim of the Communist is the same as that of all the other proletarian parties: formation of the proletariat into a class, overthrow of the bourgeois supremacy, conquest of political power by the proletariat. The abolition of existing property relations is not at all a distinctive feature of Communism. The distinguishing feature of Communism is not the abolition of property generally, but the abolition of bourgeois property. […] the theory of the Communists may be summed up in the single sentence: Abolition of private property. Hard-won, self-acquired, self-earned property! Do you mean the property of the petty artisan and of the small peasant, a form of property that preceded the bourgeois form? There is no need to abolish that; the development of industry has to a great extent already destroyed it, and is still destroying it daily. […] does wage-labour create any property for the labourer? Not a bit. It creates capital, i.e., that kind of property which exploits wage-labour, and which cannot increase except upon condition of begetting a new supply of wage-labour for fresh exploitation. Capital is […] not a personal, it is a social power. The average price of wage-labour is the minimum wage, i.e., that quantum of the means of subsistence, which is absolutely requisite in bare existence as a labourer. In bourgeois society, therefore, the past dominates the present; in Communist society, the present dominates the past. […] in your existing society, private property is already done away with for nine-tenths of the population; its existence for the few is solely due to its non-existence in the hands of those nine-tenths. In its completely developed form this family exists only among the bourgeoisie. The bourgeois sees in his wife a mere instrument of production. United action, of the leading civilised countries at least, is one of the first conditions for the emancipation of the proletariat. […] one fact is common to all past ages, viz., the exploitation of one part of society by the other. […] the following will be pretty generally applicable. Combination of agriculture with manufacturing industries; gradual abolition of the distinction between town and country, by a more equable distribution of the population over the country. Free education for all children in public schools. Abolition of children’s factory labour in its present form. Combination of education with industrial production, &c.
Political power, properly so called, is merely the organised power of one class for oppressing another. In Germany the petty-bourgeois class, a relic of the sixteenth century, and since then constantly cropping up again under various forms, is the real social basis of the existing state of things. The Socialistic bourgeois want all the advantages of modern social conditions without the struggles and dangers necessarily resulting therefrom. They desire the existing state of society minus its revolutionary and disintegrating elements. They wish for a bourgeoisie without a proletariat. Bourgeois Socialism attains adequate expression, when, and only when, it becomes a mere figure of speech. […] how can people, when once they understand their system, fail to see in it the best possible plan of the best possible state of society? The significance of Critical-Utopian Socialism and Communism bears an inverse relation to historical development. In proportion as the modern class struggle develops and takes definite shape, this fantastic standing apart from the contest, these fantastic attacks on it, lose all practical value and all theoretical justification. Therefore, although the originators of these systems were, in many respects, revolutionary, their disciples have, in every case, formed mere reactionary sects. 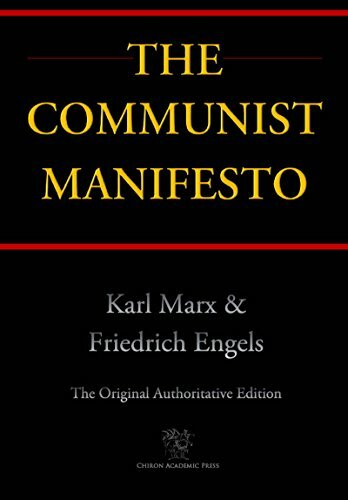 Read the whole book: The Communist Manifesto .